"You'll never get a chance like this." CJ Entertainment has debuted the official US trailer for a South Korean stock market scam thriller titled Money, the feature directorial debut of filmmaker Park Noo-ri. Money is about an aspiring stockbroker in Seoul who dreams of making big money. But being a rookie without the right connections makes it difficult for him to survive in the cut-throat world of stock exchange market. So when he is approached by "The Ticket", an anonymous mastermind who secretly controls the stock market, he takes the chance despite the dire consequences. Well, that sounds damn good. The film stars Ryu Jun-yeol, Yoo Ji-tae, Cho Woo-jin, and Kim Jae-young. Thanks to CJ Ent., the film is getting a US release later this month, just one week after it opens in Korea. And it looks fantastic! You need to watch this trailer. 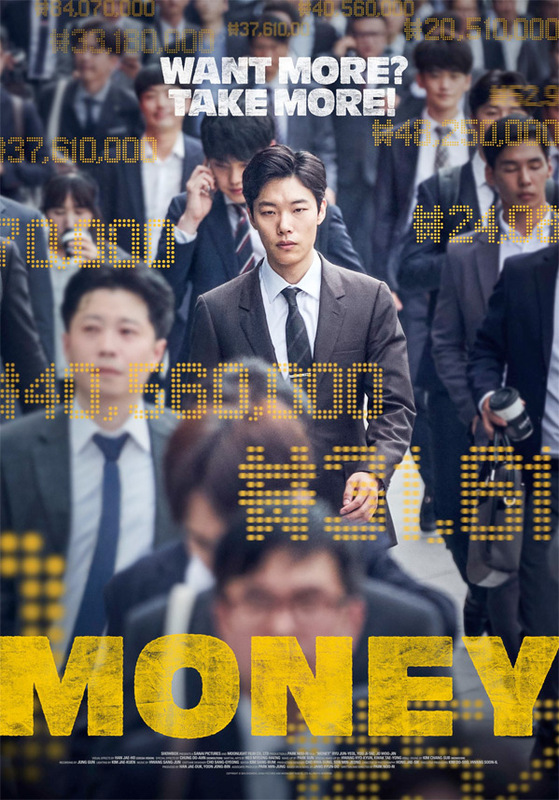 Aspiring stockbroker Il-hyun (Ryu Jun-yeol) dreams of making big money, but his lack of experience and connections in the stock market make it difficult for him to achieve his dreams. One day he is approached by 'The Ticket' (Yoo Ji-tae) an anonymous mastermind who secretly controls the stock market. Despite looming consequences, Il-hyun acquaints himself with ‘The Ticket’. After connecting with ‘The Ticket’, Il-hyun starts climbing the ladder and making billions like he had always dreamed, but as he gets more successful, things start to get tricky. The film takes a dramatic turn when ‘The Hound’, an informant from the Financial Supervisory Services, begins to track their every move. The film walks the fine line of anticipation for justice and empathy for Il-hyun. Money is both written and directed by Korean filmmaker Park Noo-ri, making her feature directorial debut after working as an assistant director previously. CJ Ent. will release Park Noo-ri's Money in select US theaters starting March 29th. Who wants to watch this film?